Sometimes i have a Journey moment against my will, and sometimes i find myself singing along and not forsaking my youth. 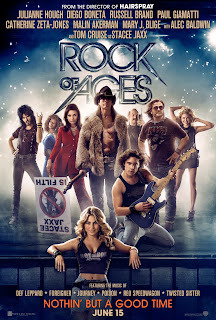 Rock of Ages is the film adaptation of the Broadway musical, brought to you by Adam Shankman. If like me you haven't see the musical, there are a few intertwined stories, Sherrie (Julianne Hough) is a small town girl from Oklahoma who moves to LA with the dream of being a singer, She of course gets robbed within minutes of getting off the bus and meet Drew (Diego Boneta) a bartender and also aspiring musician who works at the Bourbon Room, similar to say the Viper Room or CBGB , run by Dennis (Alec Baldwin) and Lonny (Russell Brand) being his usual annoying self. Also in the mix is Tom Cruise as Stacee Jaxx, the lead signer of Arsenal, think Axl Rose, and Vince Neil, with a splash of Sid Vicious. He's a temperamental, alcoholic, self-absorbed rocker with a pet monkey about to go solo. And there's the Mayor of LA and his anti-rock and roll wife who screams Tipper Gore played by Brian Cranston and Catherine Zeta-Jones. Sherrie and Drew of course fall in love and things go to hell in their relationship, Sherrie ends up a stripper in Mary J Blige's club and Drew gets signed by Stacee's manager Paul (Paul Giamatti) but the tide of music is changing away from rock and Drew ends up in a 90's boy band. That was where i got confused with this being a 80's movie. Even with the big names thats not really the point, the real point of this movie is the music. Songs by Poison, Whitesnake, Bon Jovi, Journey, Twisted Sister, Pat Benetar, I couldn't stop myself from singing along to every single song that played. Even the mashups of We Built this City with We're Not Gonna Take it, Shadows of the Night with Harden My Heart had me at the first 4 notes. The story is fine, nothing epic, some a little odd like the Dennis and Lonny storyline, some cliched but you don't care, the Mayor banging his press secretary while his wife campaigns against rock and roll., but the music is key. I came home and immediately opened Spotify to rebuild the Rock of Ages Soundtrack. The biggest thing i got asked repeatedly was how was Tom Cruise? It worked for me, I felt like i was watching old MTV videos and concert footage. Stacee Jaxx is a bit crazy and Tom didn't try to hide that. The only thing that surprised me was there was no version of Oh Sherrie but i hear that was in the Broadway musical. I give this movie a Matinee. The music sells it for me hands down but i'm also a child of the 80's i remember wanting my MTV, watching Headbanger's Ball, and doing that early 90's switch to boy bands and grunge music. It was probably fate that on my way to see Rock of Ages, Pat Benatar's "We Belong" came on the radio. This movie isn't for everyone, if you didn't grow up with this music or don't like this music this movie won't work for you. Rock of Ages is rated PG-13.